In the beginning of this process, the Vestry approved these actions for the parish to take, all of which have been done: check water bills for a year to see how much we use and when; put water conservation signs in bathrooms and kitchens; make sure we have water flow aerators on all sink faucets; ask the Property and Maintenance chair to check for and fix water leaks and see if we can install valves on toilets to reduce water use; do not use bottled water (we had already been doing this); publicize County hazardous waste collection days; obtain a rain barrel to use for watering the Dean’s garden; stop using chemical fertilizers or pesticides, and fertilize and put down pesticides only when needed, not on a regular schedule; replace chemicals with natural fertilizers and pesticides; switch to cleaning products that do not damage the environment, and, in winter, use calcium chloride de-icers, not salt-based. During a subsequent Earth Day celebration, we asked parishioners to pledge to do several water-conserving things at home. The choices included installing water flow faucets; not using bottled water; taking hazardous waste to the county recycling day; washing the car at a place that recycles water; mulching gardens to retain moisture; using biodegradable washing products. We had separate pledge options for kids, such as not letting the water run when they brush their teeth. Everyone who pledged on Earth Day signed his or her name on a colorful “water drop” and stuck it onto a big graphic of a tree, which stayed in Synod Hall through the summer. They also had a chance to win an organic cotton t-shirt, a stainless water bottle, or a water creature (frog) hand puppet. More than half the number of households that regularly attend on Sundays took the pledge. On Earth Day, we also had appropriate music, prayers, and a sermon at our service. And at the gathering after the service, we also showed a great video, “The Story of Bottled Water.” On the tables were signs with over two dozen water-related verses from the Bible and a collection of discarded water bottles the Sustainability Commission had picked up, many of the from the side of the road. Our Sunday School kids (led by Andrea John and Eileen Cera), and the youth group (led by John Carl Lewis), completed education programs provided by Greenfaith. The little kids did exercises in a program called Water is Wonderful, and the teens’ program was called Water is Life. They took a survey to see how much they knew about preserving and protecting our water. Thanks to everyone who helped to make all this happen. But remember: what we’ve done so far is just the beginning. Each of us has to continue to notice the ways we can protect and conserve our water and do what we can to make it happen! It is our great pleasure to congratulate you on your completion of the Green Faith Water Shield! You are one of the first churches and the very first Cathedral in New Jersey to graduate this innovative program. From your creative and fun pledge drive, to your visible and effective outreach and education steps, to the conservation steps you took within the building and on the grounds, you have made important changes. We are proud of your accomplishments, and honor a job well done! It has been a joy to work with you, and we look forward to collaborating together on environmental projects in the future. Please share our excitement with your entire community – we encourage you to display this letter proudly. Thank you for your commitment and your dedication. The original mission of the Sustainability Commission is “to cultivate, within our parish and the community we serve, a sense of responsibility for, and commitment to, the preservation of God’s creation.” The Sustainability Commission itself is now on hiatus, but our work to care for God's creation continues . . . Recently, our focus has been on conserving and protecting our water resources. We’ve done that by working with Greenfaith, an organization whose mission it is to work with communities of every faith to care for the earth. We have been working on their Water Shield program. We started on Earth Day 2013, by showing a great video called The Story of Bottled Water, about how much it costs to produce, transport, and buy bottled water, and where all those millions of plastic bottles end up. It seems especially senseless to buy water that way, especially when you realize that much of the bottled water is tap water! We also displayed over 150 plastic bottles the Sustainability Commission members collected in a month, many of them found thrown on the side of the road. · Check the water bills for the last year to see how much we use and when. 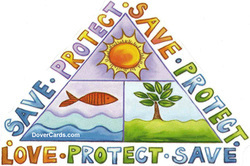 · Put water conservation signs in the bathrooms and kitchens. · Make sure we have water flow aerators on all our sink faucets. · Check for water leaks, and fix any that are found. · Publicize Mercer County hazardous waste collection days. · Install a rain barrel in the Dean’s Memorial Garden. · Do not use chemical pesticides and fertilizers. · Replace chemical pesticides and fertilizers with natural ones. · Switch to cleaning products that do not damage the environment. · Don’t use salt-based de-icers; use calcium chloride or other non-polluting de-icer. The other part of the program is for parishioners to pledge to do some simple water conservation things at home. Most of the attendees did that. We had separate pledges for kids, and many of them signed up as well. Setting the thermostats down 2 degrees lower in the winter, and keeping the temperature in the Cathedral as low as is safe for the organ; heating the Cathedral only for concerts, other events, and holy days; using recycled paper for printing and printing documents double-sided; using only biodegradable products for hospitality hours and events (no Styrofoam or petroleum-based plastics); reviewing the energy audit done by Greenfaith to see if there are any energy savings we have not yet implemented; checking the contract with our electricity provider and be sure it’s the best plan for us; replacing any cleaning or gardening products that damage the environment with products that are safer, provided they are not significantly more expensive; and turning off the lights when not in use. We invite you to join us in planning our next efforts lead our parish in protecting our environment!